Pull the headrest upwards to the desired height. Check that it is correctly locked. Press button 1 and guide the headrest down to the desired height. Check that it is correctly locked. Raise the headrest to its highest position (tilt the seatback backwards if necessary). Press button 1 and lift the headrest to release it. Insert the headrest rods into the holes (tilt the seatback backwards if necessary). Lower the headrest until it locks and press button 1 to adjust to the desired height. Check that each rod 2 on the seatback is securely locked. The headrest is important for safety. 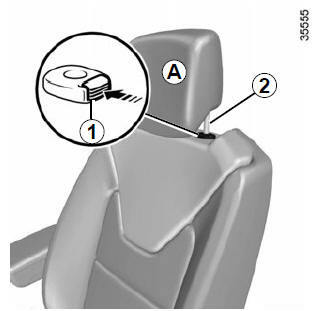 Ensure that it is in place and in the correct position: the top of the headrest should be as close as possible to the top of the head and there must be a minimal distance between the head and the headrest A.